The drums of conspiracy are already pounding and no doubt will grow increasingly louder as we approach the 50th anniversary of the JFK assassination this November. The co-called JFK “research” community is in a tizzy over Dallas city official plans to cordon off Dealey Plaza on November 22nd in order to hold a ticket-by-lottery ceremony featuring the tolling of church bells, a moment of silence, and readings by Pulitzer Prize-winning historian David McCullough from the president’s speeches. Apparently, this is too much for conspiracy advocates, who claim that the city’s plan for a respectful one to two-hour ceremony open to ticket holders only (though, the event will be televised on screens placed throughout the downtown area) somehow violates their right to free speech. For the past fifty-years, conspiracy theorists have practically had Dealey Plaza all to themselves for annual events marking the assassination, saying – and doing – just about anything they liked. What’s so unfair about a group of their fellow citizens holding a respectful vigil this year? And what’s to prevent the conspiracy advocates from holding their own event immediately following the city-planned event just as they’ve always done? Nothing. There’s only one difference this year – a national limelight. Obviously, conspiracy advocates would like to grab center-stage while the cameras are rolling. That’s what the city planners are afraid of. Expect fireworks in the Plaza this fall. Two un-newsworthy stories have been making the online papers recently. Both involve theories in which President Kennedy was an accidental victim. Author James Reston, Jr., believes that Oswald was targeting Governor John Connally when he accidentally plugged Kennedy. Oswald, you see, was still smarting over his belated dishonorable discharge from the Marines, following his attempted defection to the Soviet Union. Connally was Secretary of the Navy at the time and, according to Reston, Oswald held him responsible. All of this was originally put forth in Reston’s 1989 book, Lone Star: The Life of John Connally, and apparently will be elaborated upon in Reston’s new book, The Accidental Victim: JFK, Lee Harvey Oswald, and The Real Target in Dallas, due out in October. Even assassination greenhorns know that Reston’s theory dates back to the weekend of the assassination. The Warren Commission dealt with this theory in their 1964 report (p.387), dismissing it on the grounds that Kennedy “almost completely blocked Oswald’s view of the Governor prior to the time the first shot struck the President” and that it seemed unlikely that Oswald would have chosen a time when the Governor was surrounded by presidential security to strike. Whatever one thinks of Reston's theory (and we don't believe it for a minute, although we haven't read the new book), few could argue that the news media's superficial investigation of Reston's theory and subsequent treatment of it as "news" is symptomatic of today's 24-hour news cycle. Reston's theory is not alone in being treated like "news" when in fact, it's not. Case in point, another news story that circled the globe recently – and God only knows why. 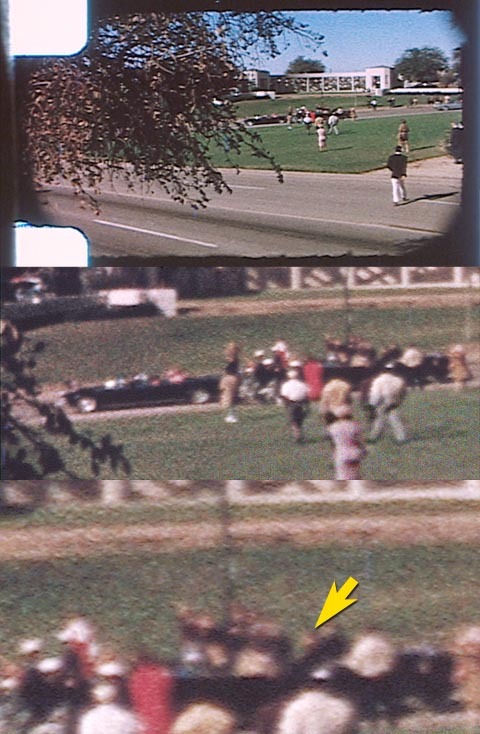 This one surrounds the 21-year-old claim that Secret Service agent George Hickey, riding in the car immediately behind the presidential limousine, accidentally shot Kennedy’s head off when he grabbed an AR-15 automatic rifle to defend the chief executive. The fact that this story ran – again – raises the question: Does the news media know about Wikipedia? George Hickey, who died in 2009, sued St. Martin’s Press in 1995 over the outrageous claims made in Bonar Menninger’s 1992 book Mortal Error only to be told that he had waited too long after the book’s initial publication to file against the publisher. Hickey later settled with St. Martin’s Press, who apologized. If the earlier Hickey lawsuit wasn’t enough to dissuade the news media from treating this creaky story seriously, one only had to do a little research to find out that nine Secret Service agents were within a few feet of Hickey and all testified before the Warren Commission or gave statements about the day’s event and yet not one of them said they saw or heard Hickey’s AR-15 fired that day. All of these facts are easily accessible except, apparently, by world’s news media. We wonder if ReelZ will show the amateur film of the assassination made by Charles Bronson, which shows Hickey seated at the moment of the fatal head shot? Perhaps they’ll be able to explain how Hickey was able to accidentally shoot Kennedy through the windshield of the Secret Service follow-up car without leaving a trace. Now that’s a magic bullet! Another story that circled the globe recently revolves around the decade long effort to get the CIA to release files related to George Joannides, a now deceased case officer with alleged ties to Oswald. “This is not about conspiracy, this is about transparency,” insists Jefferson Morley, a former Washington Post reporter who is spearheading the effort. It is clear from his own writings that Morley suspects that a link existed between Joannides and Oswald’s activities in New Orleans in the summer of 1963, though Morley acknowledges that he just doesn’t know – and won’t know until and if the CIA releases the Joannides files. Fair enough. In the August 17 Associated Press story about Morley’s efforts, “5 Decades Later, Some JFK Assassination Files Still Sealed; Researchers Demand ‘Transparency’,” writer David Porter manages to help perpetuate one of the great myths about the assassination - one that is sure to gain even more traction among the uninformed this November. “…Certain files held by the Warren Commission and House Select Committee were originally ordered sealed, for privacy, security and other considerations, well into the 21st century. “Decades passed before public pressure spurred by Oliver Stone’s 1991 film “JFK” changed that. It is almost a rite of passage for conspiracy theorists to cling to the false belief that the assassination files have been sealed away where the government doesn’t want us to get our grubby little hands on them until 2039. Here though, we get an added twist to the story, that Oliver’s Stone’s 1991 factually-challenged film JFK led to the government coughing up the truth in the form of five million pages of previously withheld documents. The reality is, of course, that the government never sealed the files, and that the vast majority have been available for more than a decade – many much longer than that. Conspiracy advocates often quote how Earl Warren told reporters shortly after the release of the Warren Report in September, 1964, that some things would not be revealed in our lifetime. How could he? It was the first day of testimony taken from anyone. This single quote – taken out of context – has fueled the belief by many that Earl Warren, having seen all the evidence and heard all the testimony, ordered the files sealed for seventy-five years. Nonsense. As a result, by July 19, 1966 – less than three years after the assassination - approximately 80% of records from federal agencies (FBI, CIA, etc) that the Commission had turned over to the archives had already been released to the public. No matter. Two years later, New Orleans District Attorney Jim Garrison (the hero of Oliver Stone’s JFK) was telling jurors in the Clay Shaw trial that they would have to wait until 2039 to find out who killed Kennedy. Despite the fact that by 1992, 98% of the Warren Commission records had already been released, the general public was still being peppered with the lie that the files would not be released in their lifetime. Of course, the proposition that the assassination records being withheld by the government are the key to who really killed JFK is ridiculous on its face. First, what we haven’t seen cannot undo what we have seen. And what we have seen is that there is not one shred of believable evidence that the CIA or any other government agency was behind the assassination. The House Select Committee on Assassinations came to the same conclusion in 1978. The evidence repeatedly and consistently comes back to Oswald. Second, who could possibly believe that any government official or rogue individual allegedly involved with Oswald in the crime or its cover up would have left behind incriminating evidence? It’s downright laughable, but many still cling to such notions. Today, the National Archives contains about 2,000 cubic feet of assassination records – including those of the Warren Commission (1964), the House Select Committee on Assassinations (1978), and the Assassinations Record Review Board (1992), as well as the investigative files of the FBI, CIA, Secret Service, and on and on – representing over 350,000 documents totaling over 5 million pages. Nearly 100% (99.9) had been released to the public by 2001 - more than a decade ago. What the various agencies did protect and redact, according to Tunheim, were sources and methods – i.e., the names of intelligence agents, methods of intelligence gathering (some still in use today), matters pertaining to presidential security - and in a few cases, matters involving personal privacy. Trusted senior NARA archivists who have overseen the storage of the records for decades agree having told us repeatedly that there is no large cache of JFK assassination material anywhere in their possession or in the possession of other agencies. Approximately 5,000 pages (“a tiny fraction of 1 percent of the information in all the documents collectively,” says Tunheim) have not been released as of 2007, but are scheduled to be released by 2017. A petition by assassination researchers to move the 2017 release up to 2013 (in honor of the 50th anniversary of the assassination) was turned down by the National Archives due to logistics. One thousand of these 5,000 withheld pages (a fraction of a tiny fraction) relate to deceased CIA case officer George Joannides. These are the pages that are the subject of Morley’s lawsuit. What’s in the withheld files? Morley doesn’t know, but is guessing it is something big. “When I say the CIA is hiding something big,” Morley explained, “I am NOT saying the CIA is hiding ‘smoking gun’ proof of a conspiracy. We couldn’t agree more. Until we see the files, nothing can be ruled out. But that doesn’t mean the inverse is true – i.e., that all things, imagined or otherwise, are possible until the CIA shows us their hand. Morley did overstate two things in his interview with Porter. Surely, Morley didn’t mean the CIA was paying attention to Oswald the night before the assassination, but rather, the period of months and weeks before the assassination when Oswald was in New Orleans and traveled to Mexico City. What else might be in the Joannides files? Morley has made a number of guesses over the passed ten years. “[Joannides] was based in Miami where the Revolutionary Student Directorate (DRE) had its main headquarters,” Morley explained in a 2006 interview, “but the confrontation between the Directorate’s members and Oswald took place in New Orleans. So, one question was: Did Joannides ever go there? “And the records that we obtained show that he did. There are two travel expense forms in [the Joannides files] that show that he traveled to New Orleans in April and May of 1964. Those dates are highly relevant because members of the Warren Commission were in New Orleans in both those months interviewing members of the DRE about their confrontation with Oswald. Of course, there is no actual evidence that Joannides coached or tampered with DRE witnesses. More important, where is the evidence that Joannides was steering Oswald or that he traveled to New Orleans in the summer of 1963 when Oswald was there? Apparently Morley is guessing that the evidence of such activities might be in the withheld files. Might be? What else does Morley guess is in the withheld files? Wait a minute. Did we miss something? Didn’t Morley just say that Joannides received a career long achievement award? What makes him think that the award singles out anything that Joannides specifically did in the years 1963 and 1978? Morley acknowledged in 2006 that a five-page citation that accompanied the Joannides medal was being withheld in full. So, apparently Morley doesn’t know whether 1963 or 1978 was singled out for praise or not. Or could it be that the CIA is simply being protective of living sources? After all, the Castro brothers are still in power. And Miami is still riddled with his agents. We’ve noted on more than one occasion, that when it comes to First Amendment rights, members of the media are quick to serve jail time rather than reveal their sources and methods, for fear of losing the trust of confidential informants. Apparently the same right doesn’t exist for the intelligence community and their operatives who are responsible for protecting the American public and providing national security in life and death situations. Conspiracy advocates have had an axe to grind against the CIA ever since the shots echoed in Dealey Plaza – and perhaps, even before. While conspiracy theorists often cite the alleged remark as motivation for the CIA to do away with the chief executive two years later, they fail to report that the strained relationship between Kennedy and the CIA was extremely short-lived. In November 1961, Kennedy gave longtime family friend Allen Dulles, who oversaw the Bay of Pigs operation, the National Security Medal in a ceremony at the opening of the new CIA building. How good a friend was JFK to the CIA? In 1996, the CIA released a study about the relationship between nine presidents and the CIA over the period 1952 to 1992. That study found that “the [CIA’s] relationship with Kennedy was not only a distinct improvement over the more formal relationship with Eisenhower, but would only rarely be matched in future administrations.” (emphasis added) Not exactly the foundations for treason and murder. Conspiracy advocates focused on the CIA have also steadfastly overlooked the role Robert F. Kennedy had in manipulating the Warren Commission. When President Johnson asked Bobby Kennedy to name the people he wanted appointed to the Commission, Johnson was surprised to hear RFK name John McCloy and Allen Dulles – two CIA leaders. Dulles, of course, knew about White House plans to kill Fidel Castro and kept it from the Warren Commission. While conspiracy theorists have been hot to expose all things CIA, there seems to be little attention paid to the five-dozen crates of government files kept secret by Robert Kennedy and the Kennedy family for the last forty years. When the Assassinations Records Review Board (ARRB) perused the Kennedy Library holdings in search of assassination-related material in 1996, they located “a wealth of Cuba material” that the Board called “relevant.” Yet, when the Board disbanded in 1998, they had not been any more successful than the independent researchers in extracting the files. The ARRB analysts did however deposit a 43-page Finding Aid for the material in the National Archives at College Park, MD., - an internal Library document obtained in 1995 that is very different from the one put online by the Kennedy Library. 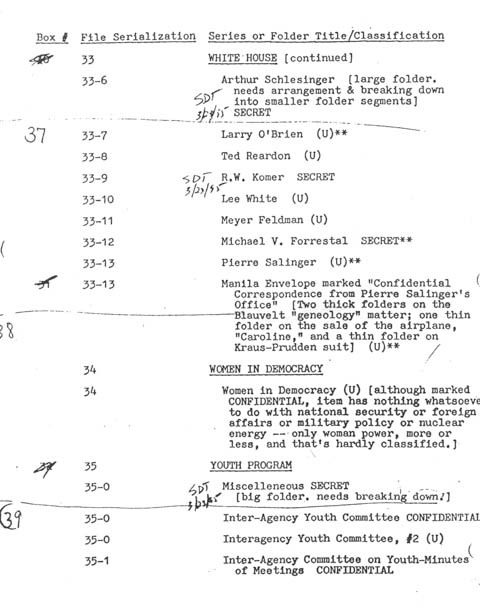 Three pages from the RFK Files Finding Aid. • “John McCone” - CIA Director; voiced opposition to the Castro plots, Mongoose, and the coup in South Vietnam, which JFK authorized. • “Richard Helms” - DDP, CIA's man in charge of Cuban Ops, Mongoose. RFK repeatedly hinted to him about assassinating Castro; involved in the AMLASH op (Castro assassination project). • “Memo re Attwood” - In the weeks prior to JFK's assassination, former Ambassador William Atwood claimed he acted as JFK's secret "back channel" liaison to Fidel Castro. His actual role was never discussed by the Kennedys. • “Frank Sinatra File; Contains References to various gangsters, including Giancana and others including Judith Campbell” — Infamous Chicago mob boss Sam Giancana has been long suspected of assisting the Kennedy family in the 1960 election drive; Sinatra’s family has admitted that Frank was an intermediary in that effort. Judith Campbell (Exner) was a girlfriend of both Kennedy and Giancana. She alleged that she also acted as a liaison between the two. • “Letters from RFK to Enrique Ruiz-Williams”— Williams was a Bay of Pigs veteran known as “Bobby’s Boy.” He acted as the eyes and ears of the Attorney General within the Cuban Exile community and alleged that the Kennedy administration was gearing up for a new invasion of Cuba in 1964. • “Planned Withdrawal of US Personnel from RVN (Republic of Vietnam)”— Historians from Alexander Cockburn to Noam Chomsky to John Newman have heatedly debated what Kennedy would have done in Southeast Asia had he have lived. Director Oliver Stone went so far as to postulate in his 1991 movie JFK that Kennedy was killed in a coup d’etat over his alleged plans to withdraw troops. • “Jimmy Hoffa”— The firebrand Teamster boss was a mortal enemy of RFK, in what many have labeled a “blood feud.” About the time of RFK’s prosecution of Hoffa in the early sixties for pension fraud, Hoffa aide Ed Partin informed Kennedy’s people that Hoffa was planning on killing him in retaliation. According to Cuban exile Jose Aleman, the plan was altered to kill President Kennedy with the assistance of New Orleans mob boss Carlos Marcello. • “Assassination of Diem and Nhu.”—On November 2, 1963, just twenty days before JFK went to Dallas, South Vietnam President Ngo Dinh Diem and his younger bother and advisor Nhu were assassinated in a coup that permanently destabilized the South, and encouraged the North Vietnamese to escalate the civil war. Air Force General Ed Lansdale, who was a Vietnam specialist enlisted by the JFK to head up anti-Castro military operations (including assassination) was among those who asserted that Kennedy approved at least the possibility of killing the leaders. In 1996, co-writer Gus Russo obtained unheard Dictabelt recordings of President Kennedy from Kennedy’s secretary Evelyn Lincoln. The belts were taken to Dictabelt headquarters in Melbourne, Florida, where they were played for the first time. On a November 4, 1963 recording, the President admits that he approved the coup plans, but that it was a huge mistake. • “Martin Luther King” —The civil rights icon was embroiled in controversy stemming from both his extra-marital life and also alleged infiltration of his ranks by communists. In the fall of 1963, Attorney General Kennedy approved wiretaps of King in hopes of preventing a derailing of the Kennedy Administration’s new Civil Rights Bill proposal. • “Cuban Revolutionary Council” – With a $1 million dollar per year US endowment, the CRC, a group of Miami and New Orleans-based anti-Castro militants, was formed in close coordination with the Kennedy White House after the 1961 Bay of Pigs fiasco. A White House memo noted: “The United States regards the Revolutionary Council as the central point of contact in its dealings with the Cuban exile community and underground activity.” In its mailings, the CRC’s American adversary, The Fair Play for Cuba Committee, alerted its members, such as pro-Castro-ite Lee Harvey Oswald, of the CRC’s counterterrorism plans against Castro. Oswald soon began handing out pro-Castro leaflets in New Orleans stamped with the address of the local CRC chapter. “Oswald did it to embarrass me,” said New Orleans CRC delegate Sergio Arcacha Smith, a local contact and confidante of the Attorney General. • “CIA: Operation Mongoose. TOP SECRET”—consists of four folders referencing the CIA counterinsurgency plan hatched by the brothers Kennedy in late 1961—Bobby was nicknamed “Mr. Mongoose.” Based in Florida, with a hitherto unheard of CIA budget allocation and hundreds of CIA agents, the operation launched thousands of raids against Cuba that included crop contamination, bombing refineries and mines, and most likely, assassinations. Noam Chomsky later said, Operation Mongoose “won the prize for the largest operation of international terrorism in the world.” The program ended with the death of President Kennedy late 1963. If researchers had spent as much time pursuing the RFK files as they have chasing the CIA withholdings, we might a better understanding of the relationship between the Kennedys and the agency efforts to rid the world of Oswald’s hero, Fidel Castro. What Morley does have is a passion for seeking the truth about what the CIA knew or did not know about Lee Harvey Oswald in the months leading up to the assassination. For that, we applaud his efforts. However, passion does not make a story; facts do. For more than a decade, Morley has been in search of facts surrounding the George Joannides case. What he has uncovered so far is interesting to a point, but comes nowhere close to proving a relationship between the CIA’s Joannides and Lee Harvey Oswald. While the suggestion that there might have been a relationship makes splashy copy, especially on the eve of the 50th anniversary, it hardly adds to our knowledge of what actually happened in 1963. So please, for the love of God, stop insinuating that a relationship existed between Joannides and Oswald without some kind of proof – certainly, something more than we’ve seen so far. Really. We get it. George Joannides is potentially – potentially – a central figure in the Oswald story. But until the files currently being withheld by the CIA are released and prove those suspicions to be true, there is no story; no matter how bad believers in the “big conspiracy” want it to be so. The fact that the CIA is withholding the Joannides files doesn’t mean anything. This may be hard for conspiracy theorists to understand, but the fact that the CIA keeps secrets is not unusual. That’s their business; so there’s nothing odd about that. On the other hand, if you or I kept a secret for 40-plus years; that would be significant for the simple reason that keeping secrets is not our business. So, trying to make something out of the fact that the CIA is keeping secret files about a case officer that - and here’s the part that even Morley acknowledges he doesn’t know for sure - may or may not have known about Oswald before the assassination smacks of provocation at best, and propaganda at worst. And let’s knock off all the talk about how gaining access to the Joannides files is not about conspiracy, but about transparency. Nobody believes that. This is all about conspiracy - the possibility that some members of the CIA conspired with Oswald in some kind of secret operation against Castro before the assassination, the possibility that some CIA officers knew of Oswald’s capacity for violence before Dallas, or worse, that some CIA officers could have actually prevented what Oswald did on November 22nd. Morley said as much in 2008, when he referred to Joannides as “a career CIA undercover officer allegedly involved in the events that led that to the murder of the president on Nov. 22, 1963.”  Of course, it was Morley himself who was the one making the allegation. Maybe it’s just me, but the suggestion that the CIA might have been manipulating Oswald prior to the assassination sure sounds like a potential conspiracy to me, or at the very least, a significant cover-up. “On the crime scene evidence, reasonable people will differ. To me, the single bullet theory, the forensic linchpin of all arguments for Oswald's sole guilt, has lost scientific validity in the past decade via both Pat Grant and Erik Randich's ballistics analysis and via the sworn testimony of FBI agents Sibert and O'Neill. “The JFK medical evidence is much less trustworthy than was known a decade ago. Photographs have been culled from the collection. Multiple new witnesses say independently and under oath that Kennedy's body and wounds were cleaned up before being photographed for the record. Any indictment of Oswald based on the medical evidence of Kennedy's wounds has been undermined. “The acoustic evidence remains in dispute. In my view, it has not been disqualified until an alternative explanation for the order in the data is confirmed. Yes, transparency about what the CIA knew and didn’t know about Oswald is no doubt part of what fuels Morley’s passion to gain access to the Joannides files. But let’s get real – without a doubt, the big story here is not about transparency. It’s about the possibility of a CIA conspiracy to cover up (or worse) their involvement with Oswald shortly before he murdered President Kennedy - the Holy Grail for every conspiracy theorist for more than five decades. Again, it’s about conspiracy, and everybody knows it. For more than ten years, Morley as been chasing the shadow of a story. If he ever catches it, he’ll have something. 18. Actually, the facts questioned by Morley are not in dispute, except among a microscopic contingent of conspirati – a similar sized contingent also believes we never went to the moon, the CIA orchestrated 9-11, Bill Clinton was an alien, and Elvis is lunching at a Burger King in Michigan. For every witness that says JFK’s body was altered, there are fifty who say it wasn’t. For every person who says Oswald didn’t murder Tippit, there are a horde of ballistics experts who say the shells found at the scene were matched to the pistol taken from Oswald at his arrest to the exclusion of all other weapons. Mr. Myers & Mr. Russo twist truth, no trust. Dale does a good job again in summing up some of the conspiracy out there and then dealing with it with and common sense. "When President Johnson asked Bobby Kennedy to name the people he wanted appointed to the Commission, Johnson was surprised to hear RFK name John McCloy and Allen Dulles – two CIA leaders." Where did THIS come from? Although it does get to the heart of the matter, this statement is a complete lie. Baltimore, No, it's not a lie. It's a fact. There are three sources for LBJ's statement: (1) LBJ tape recordings, conversation with Abe Fortas, 12/16/66, Side B; (2) LBJ's memoir, "The Vantage Point," p.48; and (3)LBJ told the publisher of his memoirs, Lord George Weidenfeld (who wrote of it in his own memoir, "Remembering My Good Friends," p.350), "I could never understand why Bobby tried to put some CIA people on the Warren Commission." Wrong, Dale. There's no evidence whatsoever that Bobby Kennedy placed (or even tried to place) people on the Warren Commission; he was completely out of that loop. Denial. Of course. Thanks for playing. "What we haven't seen cannot undo what we have seen." This self-serving sentiment is oft-repeated here in your diatribes against the push for the expedited release of suppressed files. It is illogical on its face, and a classic ipse dixit fallacy (he, himself, said it). In essence, you baldly assert - with zero support - that new information cannot negate or change or "undo" old information. Sure it can. Government documents contradict each other all the time, as do intelligence personnel, who are trained to deceive. Compartmentalization at intelligence agencies has demonstrated time and again that one department or unit won't have a need to know what the other is doing. As such, new and unreleased information from one division may negate entirely old released information from another. If we have a complete record, we can compare conflicting documents and reports and properly assess the probative and historical value of them. A related example: The CIA told the Warren Commission that they didn't know about Oswald visiting the Cuban embassy in Mexico City until after JFK was killed. CIA officer David Atlee Phillips was in charge of surveillance of the Cuban embassy. He admitted in his final memoir that he observed the Cuban reaction when Oswald visited their embassy. A fair reading of his words suggests he may have monitored the Cubans dealing with Oswald in real time. That's powerful evidence that may very well just "undo" what the Agency originally told the Warren Commission about what they knew about Oswald and when they knew it. See www.LimitedHangout.Tumblr.com for more information. And please, don't tell me I'm insinuating a conspiracy involving David Phillips, because I'm not. There are multiple possible explanations for such divergent information. Hard though it may be for you to accept, some people actually are simply interested in a more complete, rounded, and transparent history of intelligence matters surrounding the JFK assassination, all without an agenda to push. "...some people actually are simply interested in a more complete, rounded, and transparent history of intelligence matters surrounding the JFK assassination." First, there's no proof that what Morley is after has anything to do with the assassination! Exactly what Tunheim and the archivists have told us - unless they're in on it. Why would Tunheim, who has seen the files, lie about their content? Second, we agreed in the article with finding a more complete history. Steve, you might know some Latin, but you have a hard time with Greek (syllogism): "What we have seen" refers to the fact that Morley's imagined documents aren't evidence against the existing record. Morley's twisted syllogism however seems to be: "All things hidden must be bad/CIA hides things/therefore CIA is bad." Poppycock. We never even attempted to dissuade Morley (or anyone) from making FOIA requests. We just wish they'd not muddy the waters with speculations that only serve to convince the press that a story exists when it doesn't. We have done many dozens of FOIAs over the last thirty years, usually based on hunches. But we didn't spin them into stories for the media while we were still waiting to see them. And since 99.9% of the collective JFK FOIAs since the seventies have not yielded a clue about a conspiracy (other than strange activities in Mexico City), why should anyone believe on faith that Morley's hunch will fall into the 1%? You’ve done a great service through the years investigating every aspect of this tragic event. In the frame above from the Bronson film did you intentionally place the yellow arrow pointing at the black stick between the two SS Agents in the backseat? 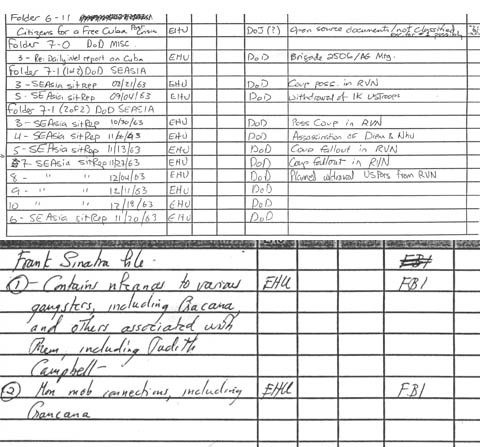 This object is obviously the AR-15 that SSA Hickey grabbed during the motorcade. I've never seen a magnified frame of the Bronson film before, so thank you for posting it. This could be a historic moment in the study of this complicated case. Does Gary Mack know about this? Surely he would after so many years of being gatekeeper to the Bronson film. Wonder why he never made it public? The arrow points to Hickey's head. What looks like a "stick" (which you describe as the AR-15) is an artifact of grain in the film, not a firearm. Have you enlarged this frame to be sure? It is a straight black line. How can that be an artifact? The two bottom iterations of the frame in question are successive enlargements of the top image. Bronson was filming from nearly one hundred feet away. That means there is a lot of film grain present in the bottom enlargement - grain that changes frame-to-frame. What you can't see in these stills is that the "stick like object" you are referring to is not present in the proceeding or succeeding frames. I am curious as to the source of this copy of the Bronson film. Was this one of the films that the 6FM went about having restored? Afraid I'm out of the loop lately in the JFK world. Chris, Yes. The source is the Sixth Floor Museum at Dealey Plaza.